Unfortunately it needs to be restated that the ability of vintners like Mr. Smith to make wine in this county today is a direct result of property rights that were denied to property owners in 1968. 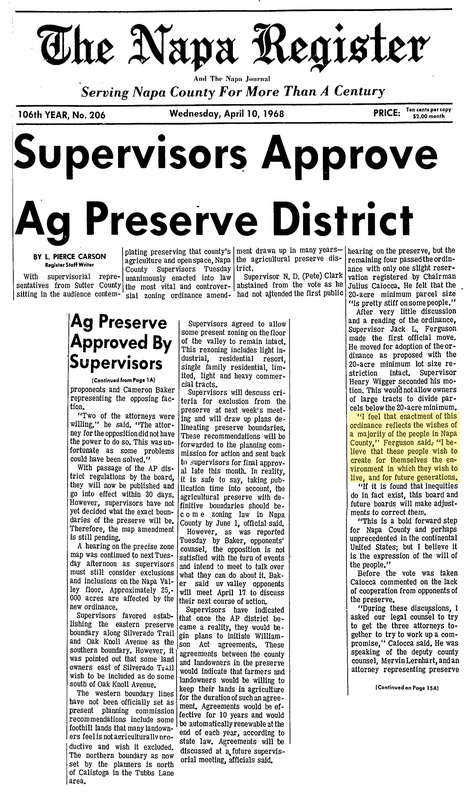 The purpose of the Ag Preserve was not seen at the time as simply about the protection of an agricultural industry from urban development; it was, in the words of Supervisor Jack Ferguson at the time, that the people of Napa "wish to create for themselves the environment in which they wish to live, and for future generations." The Watershed Initiative, likewise, is about the environment in which we, and future generations, wish to live. Will there be economic impacts to the Initiative? Perhaps. But they are no more predictable than were those of the 1968 decision. And unlike 50 years ago, there is much less danger that the impacts will affect current property owners like Mr. Smith. The woodlands protected by the initiative are a limit on future development, most likely undertaken by future owners. As they were in 1968, the negative implications are probably greater for the real estate industry than the wine industry. 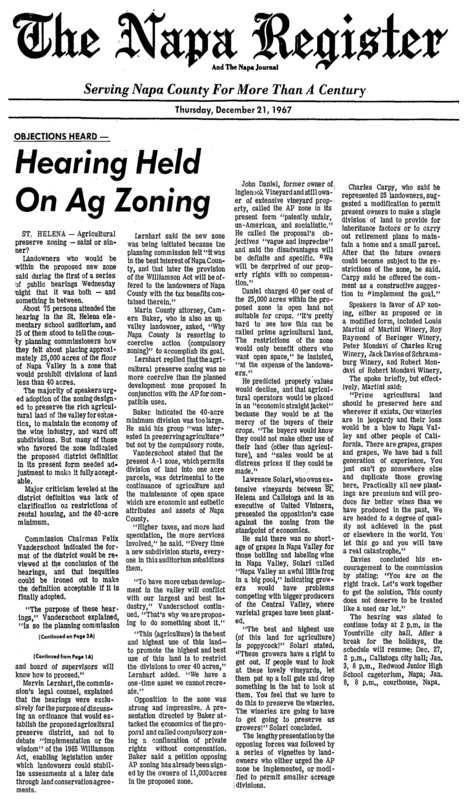 And for agricultural enterprises, now as then, dampening the real estate market is a very good thing. There may be vintners and growers sitting on undeveloped woodland that they had always hoped some day to plant or sell off to some plutocrat or corporation. They can console themselves with the increased value of their existing vineyards. There are probably those that see this as an infringement on their ability to expand their wine production - but let's face it, expanding production of wine in Napa has definitely become a secondary concern behind the expansion of wine-tasting experiences and venues. Indeed, the limited quantity of high-quality wine produced in the county is probably a major part of its success. The wine industry will remain healthy, as it is now, whether the hills are clothed in oaks or vines. The property rights argument, as Mr. Smith presents it here, seems more a philosophical thing, an indignation that government should curtail his rights. Get over it. We live in a world of laws that proscribe our rights, and while there may be bad ones, there are also good ones, like the Ag Preserve. You may end up with a little less wealth under the Watershed Initiative - though I doubt it - but as with the Ag Preserve, Napa will be a better environment in which to live.